Figures show that thousands of households on the Isle of Wight have benefitted from a soon-to-be scrapped green energy scheme. Thousands of households on the Isle of Wight have benefitted from a soon-to-be scrapped green energy scheme, figures show. Households with green energy generators such as solar panels or wind turbines are currently able to earn money for the electricity they produce. Government plans could see the scheme – known as the feed-in tariff – closed to new participants from next March. Campaigners warn the move will make green energy less attractive, and could lead to a drop in installations costing jobs in the sector. Figures from the Department for Business, Energy and Industrial Strategy show 2,986 households on the Isle of Wight had signed up to the scheme as of September. This equates to a rate of 466 installations per 10,000 households. Almost all of the installations were solar panels. Frank Gordon, head of policy at the Renewable Energy Association, said the planned change would be “very damaging” for the renewables industry. “Our members are very concerned. “There are thousands of small-scale installers, 40% of whom say they could exit the solar installation market. Participants in the feed-in tariff scheme – which was introduced in 2010 – are paid both a ‘generation tariff’ and an ‘export tariff’. This means they earn money for the electricity they generate for themselves, and for the excess energy they export onto the grid for others. According to the REA, households could expect to save between £100 to £200 a year on their energy bills and receive around £100 per year from the two tariff payments. The Government announced in 2015 that it would end the generation tariff for new participants in March 2019, but has since said it will also discontinue the export tariff. Across Great Britain, almost 800,000 households have joined the scheme – around 289 in every 10,000. The region of Britian that has seen the biggest take up is the sunny south west of England, where 466 out of 10,000 households have benefitted. The lowest rate was in London, with just 60 per 10,000, followed by Scotland on 230. According to Greenpeace, the feed-in tariff has helped climate-proof Britain against “one of the biggest threats we face” by engaging people and communities with clean energy. “To get to a zero-carbon economy we have to have that kind of buy-in from the public. “By ending the tariff, the government is harming homeowners and hanging the solar industry out to dry. Around half the energy a household’s solar panels generate goes back onto the grid for others to use, according to the REA. This could lead to the “unfair” situation where households are sending energy to big suppliers for free. However, the scheme is funded through levies on suppliers. 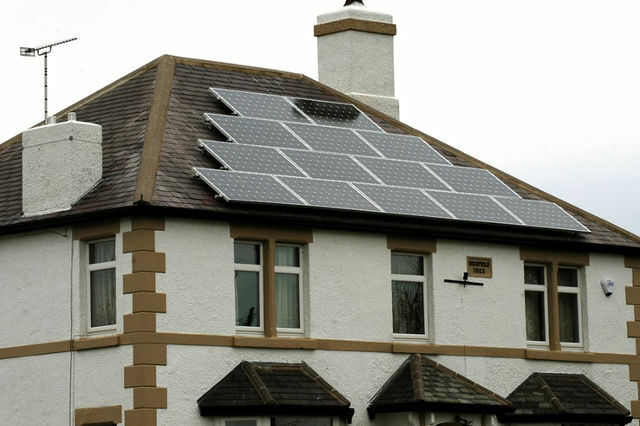 The Government says this means the cost is being passed onto consumers without solar panels. By the year 2020, the Government estimates the scheme would add a burden of £1.6 billion to consumer bills – more than three times higher than originally estimated. A spokeswoman for the DBEIS said the scheme had outstripped predictions and had helped kick-start decentralised renewable energy generation. “However, ultimately consumers pay—regardless of whether or not they directly participate in the scheme. “The UK leads the world in renewable energy and will continue to do so. 2 Comments on "Green energy scheme that benefits 1000s on Isle of Wight could close"
I looked into this several years ago with a colleague in the industry who told me the subsidy would soon not be worth the cost of the installation, so that I declined to take up the offer. This can’t come as a surprise several years on.